Rage of Light have been doing their own version of trance and heavy metal for a bit of time at this point. Starting out directly on the Bandcamp front, utilizing professional YouTube videos, and getting a good grasp of their musical identity, they have since gone on to larger pastures. Now signed to Napalm Records, they have finally delivered their first full-length album (following an EP and numerous singles) in the form of Imploder. A powerful combination of electronic/trance influences with a genuine metal core, it’s hard to listen to the album and not think of the groundbreaking ways that they can alter things in the future. With our current interest, we reached out to vocalist Melissa Bonny to catch us up on Rage of Light’s goings-on, thoughts on Imploder, and going from studio-only to being a touring band. Dead Rhetoric: Where did the idea of fusing trance and electronic music with metal first start for the band? Melissa Bonny: The idea came from our band leader and main composer Jonathan [Pellet] who likes these two music genres a lot. One day, he decided to play the music chemist and started composing a song. That was the first draft what would later become the Rage Of Light sound! Dead Rhetoric: A lot of bands have trouble establishing an identity early on. 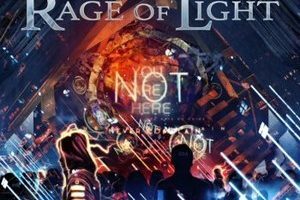 Do you feel this mix of genres helped Rage of Light design a more unique sound? Bonny: Other bands already tried before us but we think that we succeeded in finding our own sound. Fortunately, there aren’t as many bands mixing trance and metal as bands doing more “traditional” metal so perhaps it helped us reaching a fanbase that was hungry for more! Dead Rhetoric: How do you feel that the band has changed since the Chasing a Reflection EP was released? Bonny: The way we compose changed and therefore, so did our sound. It became darker and there are much more elements and details that the listener needs to pay attention to. With this album, we explore the capacities of each musician much more. 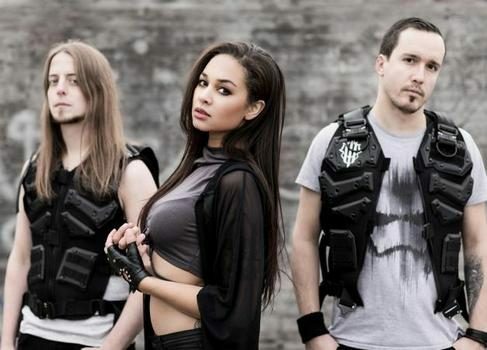 Dead Rhetoric: How did the Napalm Records signing come to be? Bonny: Napalm approached us last year. We were very enthusiastic about this chance to work with them, to promote our music in a more efficient way and to have the chance to spread it much more. Dead Rhetoric: As your first full-length, what do you really like about Imploder? Is there anything you’d like to try differently in the future? Bonny: We like the fact that this album is very complete. You will find songs that will make you headbang, songs that will transport you because of their atmosphere, songs that you will need to hear several times in order to get every element… And as previously said, we really explored the capacities of each musician so there is a big diversity of sounds. Dead Rhetoric: Two of the tracks that seem to stand out immediately are the title track and “Nothingness.” Is there anything you can say about how they were developed? Bonny: Regarding “Nothingness,” the initial idea was to use an instrument that Jon likes a lot, the cello. So that started the songwriting process. We later asked our good friend Joëlle, who also plays the cello on the song “Battlefront” to record those parts. Joëlle and Jon were playing together in Jon’s previous band, Dysrider, so he was glad to include her in this project as well. For “Imploder,” we wanted to add an instrumental track to the album in order to explore lots of different sounds, rhythmics and atmospheres in a powerful and epic way. Dead Rhetoric: How has the transition from being more of a studio band to a touring band been? Do you feel it will impact the way that you write in the future? Bonny: It was exciting. We started to plan our live shows (stage equipment, backdrops etc) and to rehearse these songs all together. For this, we recruited our very good friend Theo [Schüpbach] who is a real drum beast, believe me! The first rehearsal was truly a magical moment, and so was the first show! It was crazy to step on stage for the first time and see people singing with us! Dead Rhetoric: Outside of songwriting, much of the recording/production and video work is also done by yourselves. Does that help in getting exactly the right image for the band that you want? Bonny: It helps us in many ways. First of all, it allows us to produce more content on a regular basis. And also, like you said, to do exactly what we want to do. 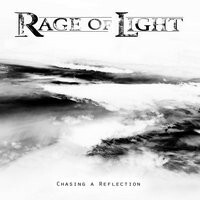 Dead Rhetoric: Rage of Light has covered several non-metal songs – “Lollypop” and “Judas.” Where does the idea come from to cover a specific track? Bonny: There is no pattern. As you can see, we covered Aqua, then Amon Amarth, then Lady Gaga. For the first two songs, Jonathan came up with the ideas and we all agreed and for Judas by Lady Gaga, we were sitting in Jon’s home studio, checking out some songs on YouTube and suddenly, “Judas” came up. Dead Rhetoric: How important do you think the visual side of the band has been in getting you noticed? They’ve always been pretty professional looking, and have a good mix of sillier ones and more serious videos. Bonny: Nowadays, it’s really important to offer regularly some visual content of good quality. That was clear for us from the beginning. We always try to show both the professional side and the “behind the scene” side in order to show who we really are. And if it can make people laugh, it’s even better! Dead Rhetoric: Can you talk about the band’s logo? Is it important to have something other than simply a name to catch people’s attention? Bonny: The first time we came up with the idea of having a logo was when we created our first t-shirt design. Then we decided to integrate it elsewhere. We thought it would be good to have a logo that could sometimes replace our band name and still identify us. For example on our merchandising. Dead Rhetoric: What’s planned following the release of Imploder? Bonny: Live shows! We spent enough time in the studio, now it’s time to meet the real world!